Did you know that your carb sensitivity changes throughout the day? It does, and this can have a big impact on your diabetes management. 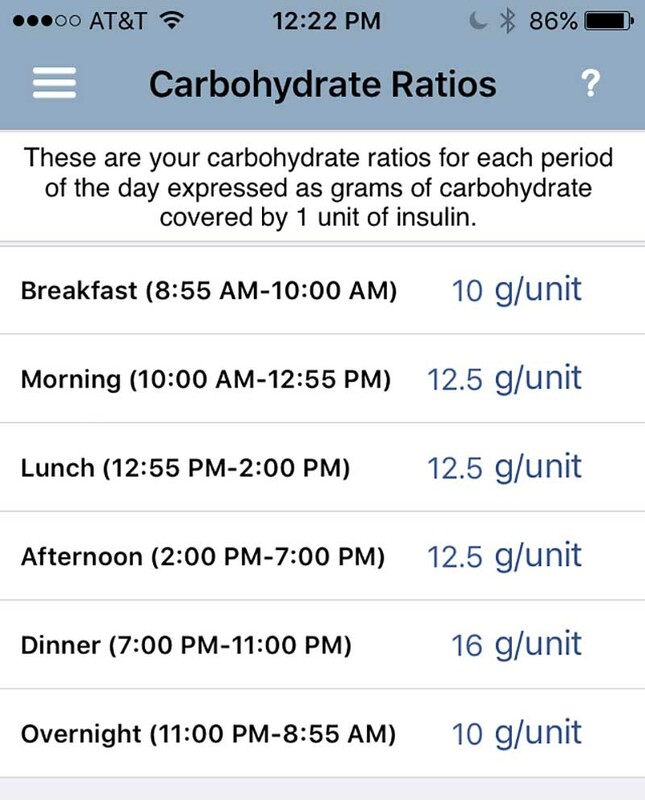 If you are an insulin-dependent diabetic like me, you probably have some sort of system through which you estimate how many units of insulin you need to bolus for a meal. Perhaps you count carbs, dose based on total calories (as Dr. Sheri Colberg described in her post about carb counting), use a sliding scale, or simply estimate it based on your experience. However, I often find that people are missing a very important piece of the puzzle, which is that your calculation should take into account how sensitive you are to carbs during the day. As Gary Scheiner describes in his book Think Like A Pancreas (I posted the relevant excerpt in the post Managing Dawn Phenomenon with Basal Insulin), our basal insulin needs will vary throughout the day and I’ve found my sensitivity to carbs to vary tremendously as well. How do I know this? Well, because I’ll need more insulin to cover a given amount of carbs in the morning than I do for the exact same type and amount of carbs at night. First and foremost, getting your different sensitivities nailed down is super important if you want to manage your diabetes as tightly as possible. If you don’t know what’s going on throughout the day, you’ll end up over and/or under-dosing a lot. From a general health and fitness perspective, this if far from optimal, and has the risk of putting you on a roller coaster of low and high blood sugar all day long. Not only is this very tiring, but it can also be extremely frustrating not understanding why you are running high or low all the time. Let’s say that you work out in the afternoon and you calculate your pre-workout dose using the same formula that you use in the morning. If you are like me, and have a higher insulin need in the morning, you would most likely end up over-dosing. And we all know what that means. You have to skip the workout or eat extra carbs that you had not planned for or want. Remember how we used my Blood Glucose tracker to learn how to reduce the risk of low blood sugars during cardio workouts (in my post about food and insulin around workouts)? The same principles apply to finding your different carb sensitivities. I suggest keeping track for of your blood sugars for about a week, and trying to keep everything as constant as possible (food, exercise, sleep, daily routine, etc.). Then, test to find your carb sensitivity at different times during the day. The way to do this is by measuring your blood sugar before you eat and writing it down, along with what you ate. Then measure again 90 minutes later. If your blood sugar is consistently within range 90 minutes after your meal, your dose is on point. If not, then you need to make changes. These can be made in collaboration with your medical team, but you need to bring them the data. If you don’t, they won’t know what changes to make. I’m self-managed, meaning that I make changes to my diabetes management on my own, and daily if needed. I check in with my endo regularly, but being self-managed has improved my quality of life and diabetes management tremendously, especially given how much my workouts affect my insulin needs. If you are a pumper, go into your settings, and you’ll see that your pump actually allows for up to 6 different carb and correction factor settings. You may not be using them today, but there is a reason why pump manufacturers put that option in there. If you are on pen therapy, like I am, you either have to keep track of it all in your head (LOL! That would require more brain capacity than I have), or use some sort of calculator. I use the RapidCalc app to keep track of it all. What you see below is a screenshot of my current settings. It’s set up pretty much like a pump, so you just enter all your information and it will calculate your recommended dose based on time of day and active insulin, just like a pump. As you can see, I’m not utilizing all 6 settings right now, and only have 3 different ratios, with my 11 PM – 10 AM period requiring the most insulin. The 10 g/unit means that I’ll need 1 unit of insulin per 10 g of carbs during that period, while I’ll only need 1 unit of insulin for 16 g of carbs in the evening. If you already have the basic blood sugar management under control, I suggest you sharpen your diabetes management skills by finding you different daily ratios. Knowing what’s going on just makes life easier, and you’ll ultimately be spending less time correcting and worrying about low or high blood sugar. Suggested next post: No Carb, Low Carb, or Moderate Carb – Which is the Best Diabetic Diet? I am so excited I found your site. I am also a type 1 diabetic and have been now for 48 years and I love to watch what I eat and work out, But lately I am starting to run into some complications with balancing my food, my work outs, and my blood sugar. I am on a Dexcom and love it. I have been on an insulin pump now for the last 6 years amd am noticing I am putting on weight and fat where I am wearing my pump. I do not like it atall and searching for answers and wondering if you no anyone else noticing this? same issue? and why do you not wear an insulin pump? for this reason? Hi Shelly – so glad you enjoy the site! I haven’t seen any research on injections causing more fat accumulation in certain areas but know of many who feel like they have more fat in the areas where they inject/pump. Maybe more aggressive site rotation could help you. Me not wearing a pump is 100% related to preference/life style. I understand the benefits of a pump and why most people love it, but I have good control with pens and this regime works for me at this time in my life.